When people get older and it becomes more challenging to move around, exercise may fall by the wayside. Seniors may view fitness as something that will add to their pain levels because working out is meant to challenge the body. Water aerobics: Working out in the water is easy on joints and takes away the risk of falling. Also, the buoyancy of the water creates a "zero-gravity" environment that allows seniors to strengthen their muscles or do cardio without the impact they'd experience on land. Running on the elliptical: Older adults who've always been runners but can no longer take part in the sport can switch to the elliptical machine. This cardio equipment simulates the movement of running and provides a good workout without the impact on lower body joints and muscles. 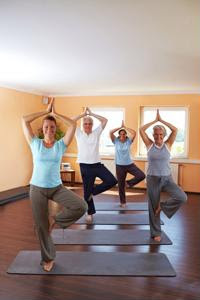 Yoga and Pilates: These two mind-body fitness formats offer a great way for seniors to strengthen their core, stretch their muscles and become stronger without having to lift heavy weights. The movements are typically slower as well, which is helpful.